Breaking News . . . Breaking News . . . Breaking News . . .Breaking News . . .
Swineflu has taken the lives of ten adults in the UK in the past six weeks according to a report by By Michael Howie that appeared in the Guardian on December 11, 2010. Most had underlying conditions but "a small proportion" were healthy before contracting the virus, a spokeswoman said. The deaths occurred in younger adults, all less than 65, an age when people begin to become vulnerable to influenza. This comes as a shock to many people as the Swineflu Outbreak had been officially declared at an end several months ago. 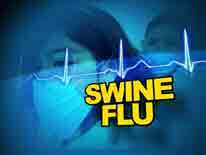 Reports on the BBC networks say that Swineflu has now become a regular seasonal flu and should be treated accordingly. Until i have done further research, i will duplicate quotes from the Guardian report, my main source and link to other news reports i find. According to Michael Howie’s report, Professor John Watson, head of respiratory diseases department at the HPA, said: "Over the last few weeks we have seen a rise in the number of cases of seasonal flu, including both H1N1 (2009) and flu B, in the community. "We have also received reports of patients with serious illness requiring hospitalisation and outbreaks of flu in schools across the country. "For most people, flu is not life threatening and usually lasts seven to 10 days. "However, it can be far more dangerous for those in at-risk groups, such as the elderly, pregnant women and patients with heart problems, diabetes or lung, liver or renal diseases, or those who have weak immune systems who are at risk of developing complications. "Flu vaccination offers the best protection for those at high risk from seasonal influenza. If you are in an at-risk group and you haven't had your jab, we recommend you make an appointment with your GP or medical practitioner now. "Although unpleasant, flu is a self-limiting illness and if you have flu it is best to stay at home until well. "If individuals in at-risk groups develop symptoms consistent with flu or if anyone whose symptoms persist or become more severe then we advise they seek medical advice." Mr. Howie also quotes Professor David Salisbury, director of immunisation at the Department of Health. According to Howie, he said: "These figures demonstrate that the effects of flu are not to be underestimated. It is not the same as getting a cold and can seriously affect your health. "The seasonal flu jab protects against the dominant strains – this year it protects against three types of flu, including the type known as swine flu.